It wasn't long after I first came to Charsfield, some twenty years ago now, that I met the writer Ronald Blythe. Although he lives in Essex these days, Ronnie has remained most people's idea of Mr Suffolk, and his writing is a touchstone to what Suffolk means. But what is a typical Suffolk village? Where is it? All villages have their unique aspects, and those they hold in common with others. When I first wrote about this church on the Suffolk Churches site, I was not the first to suggest that here, in Charsfield, there is a microcosm of what it means to be in Suffolk - the church, the pub, the old cottages, yes; but also the council houses, the football pitch, the Victorian school extended with prefabs. Here are the rural poor, living cheek by jowl with the incoming professionals and the County gentry, with all the diversity and tension this imparts to village life. Ronald Blythe wrote about Charsfield, and called it Akenfield. To read Akenfield is to read about any number of Suffolk villages in the late 1960s - but Charsfield it is, nonetheless. Not many books like Akenfield get written today. It is a rich, surprisingly bleak narrative; often brutal, at other times very moving, even painfully so. It is contemporary with other social dramas like Cathy Come Home, and it now looks its age. It is no rural idyll. For instance, we meet the reclusive Davie, living in a dire, tumbledown cottage. He remembers being sent off to the First World War; he was given a gun, which he understood because of rabbiting, and a New Testament, which he didn't, and used alternately for rolling cigarettes and toilet paper. "Did you kill men, Davie?" asks the writer. Davie replies "I got several" - the same answer to a question about how he did on a rook drive. 'Several', in Suffolk, means many. "What was the worst thing, Davie?". Davie considers. "Why, the wet, of course". Thirty years on, Charsfield is a richer place in broad economic terms, as everywhere else in Suffolk. But it is less rich in diversity, in the sheer drama of human existence. A small price to pay. In the years after Akenfield, Peggy Cole, who lives in the village in a house called Akenfield, broadcast on BBC Radio Suffolk and wrote in the East Anglian Daily Times about Suffolk folklore and village life. So the pulse of Suffolk was still being taken in Charsfield. Both Cole and Blythe appeared in the award-winning BBC television production of Akenfield, as did many other Charsfield residents. 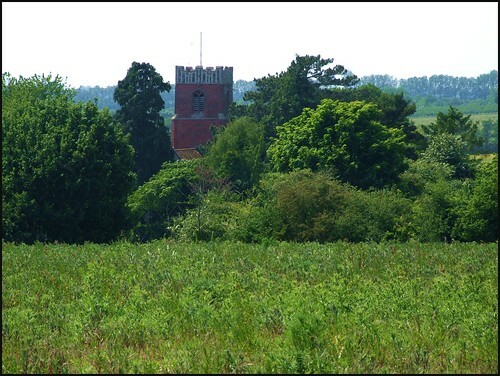 If you visit Charsfield, you will eventually wander up the hill to the church. There, you will discover Suffolk's prettiest red brick Tudor tower and porch, against the body of an older church. But the base of the previous tower survives, and it is really quite amazing. on the west side, either side of the doorway, there is a dedicatory inscription, and panels around the other two sides show the emblem of St Edmund, the Marian symbol, and a eucharistic chalice and wafer with Our Lady's initials in each corner. There are others, too; they have done well to survive. Curiously, Simon Cotton informs me of a bequest to a "new" tower in 1454. This clearly predates the Tudor period, but must postdate the earlier tower. Perhaps there were still insufficient funds for the rebuilding at that time, although Simon found no other bequests. Take away the tower and the porch, and this is a very homely little building indeed. Incidentally, if you have seen the BBC production of Akenfield, you may be surprised not to recognise the church. In fact, the graveyard here is so severely tight that it made filming difficult, and so the church at neighbouring Hoo was used in the film instead. Inside the porch, there is a curiosity. It is a broken bell, with the inscription sic sacheverellus ore melos immortali olli ecclesiae defensori hanc dicat Gulielmus Leman de Chersfield Eques 1710 ('since Sacheverell's eloquence is so musical, so this is dedicated to him, the immortal defender of the church, by Sir William Leman of Charsfield 1710'). Henry Sacheverell was an instrument of the established church in a now largely forgotten controversy. He published an attack on those who defended the rights of non-conformists. When he was accused of seditious libel, thousands bought copies of his speech for the defence, and the government of the day was brought down. The incoming Tories richly rewarded him, including the local Leman family. You step into a quiet, simple little interior, with no great excitements, which is just as it should be. The font is immediately opposite, and on one side, instead of an angel, there is a representation of St Botolph, a local saint with connections at Iken and Burgh. The war memorial is halfway along the north side, and remembers those who fought and died alongside reclusive Davie. Further east is the memorial to another William Leman. It records, grandiloquently, that Here also mingled with his parents dust sleeps till the resurrection of the Just of William Leman the mortal Part. And the immortal? That is gone to the blest regions of Eternal Light there waiting for the Lord to reunite and raise them with his parents up on high to live with him, unto Eternity. Below the memorial, a cheeky boy sits with his feet in the stocks on an early 20th century bench end. Some 350 years ealrier, another local woodcarver produced the front of the ringing chamber, and signed it G S 1587. So often, out cycling, I find villages I'd like to live in. Usually, it is winter, and there's a smell of woodsmoke in the air. Such villages have no modern council houses like the ones in Charsfield; instead, little cottages huddle together, cosy against the dwindling light and frost. How idyllic! And then I think of Leonard, aged 71, recalling his Akenfield childhood: "It was very hard living indeed... our cottage was nearly empty, except for people. There was a scrubbed brick floor, and just one rug made of scraps of old clothes pegged into a sack. Six of us boys and girls slept in one bedroom, and our parents and the baby slept in the other. There was no newspaper, and nothing to read except the Bible. All the village houses were like this. "Our food was apples, potatoes, swedes and bread. Nobody could get enough to eat, no matter how hard they tried. Two of my brothers were out to work. One was eight years old and he got three shillings a week. Our biggest trouble was water. There was no water near... 'Drink all you can at school', we were told. There was a tap there. "Our parents and all the cottage people were very religious and very patriotic. The patriotic songs and church hymns seemed equally holy. They took our breath away. It was all 'My country' - country, country, country. You heard nothing else. There was no music in the village then, except at the chapel or the church, and our family liked it so much that we hurried from one to the other to hear all we could. People believed in religion then, which I think was a good thing, because if they hadn't got religion there would have been a revolution. "I want to say this simply as a fact, that Suffolk people in my day were worked to death. It literally happened. It is not a figure of speech. I was worked mercilessly. I am not complaining about it. It is what happened to me." I cycled on, through the narrow lanes to Dallinghoo, through the fields where Leonard Thompson and his young brothers slaved. I thought about how attractive going off to war must have seemed; of those generations, brutalised and betrayed.